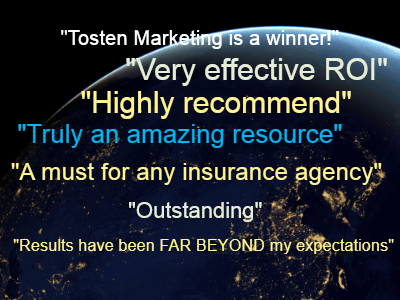 We created Tosten Marketing with one customer in mind: the independent insurance agent. We understand that as a business owner it is difficult to focus on your clients when you’re constantly thinking about where your new clients or prospects are going to come from. That’s where we come in. We create a marketing strategy and then fully execute it for you so you can focus on your clients. Click below to see what our clients have to say. https://tostenmarketing.com/wp-content/uploads/2012/10/Testimonials-World1.png 300 400 Tosten https://tostenmarketing.com/wp-content/uploads/2017/03/Tosten-Marketing-Logo-Final.png Tosten2012-10-04 19:35:182015-03-18 09:30:44"A must for any insurance agency!" Isn’t a website enough? Why have an insurance agency blog?